I am not from the East, nor from the West. Not from the land, nor from the sea. I am not from the world, not from beyond. 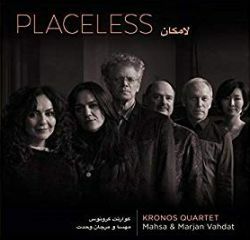 So sings Mahsa Vahdat in the title song of Placeless, the Iranian vocalist’s collaboration with sister Marjan Vahdat and the well-traveled Kronos Quartet. It’s one of those confluences of time, space, and creation that feels as inevitable as it does long overdue, and provides ample berth for these verses of Rumi to stretch their forlorn wings. Spanning 14 of Mahsa’s original melodies in arrangements by Sahba Aminikia, Jacob Garchik, and Atabak Elyasi, the strings court one adventurous spirit after another, navigating the tactile pointillism of “My Ruthless Companion” with as much depth as “My Tresses in the Wind,” the latter being the album’s most inward gaze. As Marjan weeps in slow motion over the quartet’s mournful stretch, any heart in its path is sure to lose grip on its defenses. Much of the poetry, such as Rumi’s “I Was Dead” and Elyasi’s own “Endless Embrace,” deals with questions of mortality, each answered not in the words themselves but through emotional transferences between them. Indeed, while the Kronos Quartet are known for their technical and rhythmic extroversions, this program is a reminder of their molecular sensitivities, as expressed in such ambient turns as “The Sun Rises,” in which Mahsa and Marjan trade images of the Iranian poet and film maker Forough Farrokhzad, and “Vanishing Lines,” a fugue of mind and body. Yet no matter how far these artists travel, horizontally or vertically, their presence in the moment is clear. Whether looking into a lover’s eyes, as in “Far Away Glance” and “The Color of Moonlight,” or seeking metaphysical shelter in “Eternal Meadow,” vast delineations of space and time are collapsed into compact phrasings, each a reflection of its own itineracy. Forough Farrokhzad's "The Sun Rises"